George returned to journalism, went on the lecture circuit, wrote five more books, and dedicated himself to spreading the word of the single tax. He has been credited with inspiring a generation of progressive reformers. William Jennings Bryan said thatProgress and Poverty “ought to be read by every thinking man and woman.” Samuel Gompers, Jacob Riis, Upton Sinclair, and Ida Tarbell read him and sang his praises. But George showed little interest in reform beyond the single tax. A believer to the end in Adam Smith, he denounced the socialists and labor organizers who were his strongest supporters, and, as one critic wrote, came to lead single-tax supporters “of intolerably dogmatic and doctrinaire spirit.” He refused to accept that unearned income might be gleaned from investments other than land, and thus he was accused of failing to confront the rising power of finance capitalism, which made money off of the socially created value behind stocks and bonds. By the time of his death in 1897, when 100,000 New Yorkers lined up to view his body in state, George’s “great idea” was already, as Tolstoy would lament in 1908, on the long road to being forgotten. 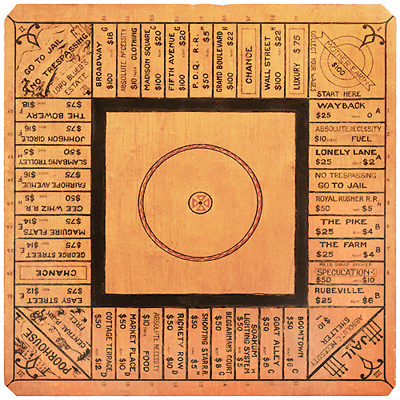 I had earlier looked up Magie’s 1904 rule set, which she produced several months before she and Woolery completed the original board. Oddly, it contained no rule about forming monopolies out of the property groups, nor did it mention charging players higher fees after they’d built houses or hotels (constructions that also didn’t exist in Magie’s original rules). Nor was there anything about Henry George, land-value taxation, or the evil of rent. 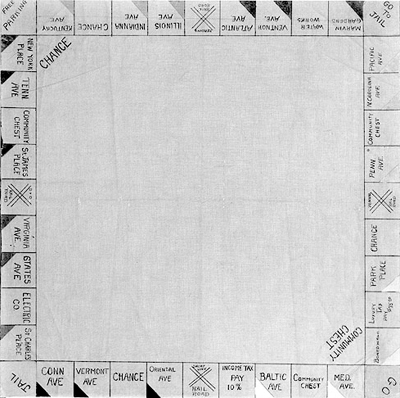 If the game was designed to teach Georgism, it seemed Magie hadn’t quite thought out the lesson. 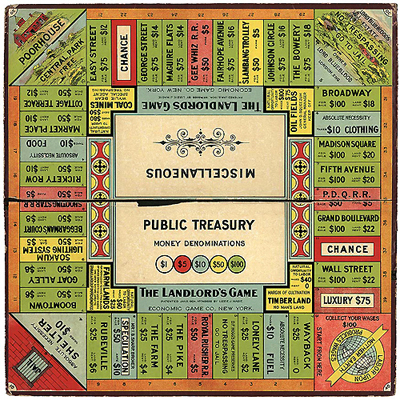 Two years later, when the game was officially published,the rules had evolved: the business principle of monopoly was fully established, as was the Georgist alternative of cooperation. Theories abound as to how the changes arose; one holds that someone in Arden had pushed The Landlord’s Game in the direction of Henry George, and also in the direction of the Monopoly we know today. Land Value Taxation will solve many of the 21st century’s most serious social, economic and environmental problems, and promote justice, fairness and sustainability. We CAN have a world in which all can prosper. I’ve not read far into the book yet — and it is available online as a PDF file — but by the time I was into the first chapter, it was clear that Dr. Piketty’s economic education, extensive as it might be, entirely omitted the ideas of the classical economists who described a 3-factor economy: land, labor and capital. Piketty, like nearly everyone educated in economics in the past 40 to 80 years, writes as if there were only two factors — labor and capital — treating land as if it were a mere subset of capital, with no reason to recognize it as differentiated. Land — not only urban sites, but also the other things the classical economists would recognize as Land, such as water rights, oil, electromagnetic spectrum (our airwaves which we all say belong to the American people, but which are in reality owned by corporations), landing rights at busy landlocked airports, geosynchronous orbits, urban street parking, the value of dozens of other non-renewable natural resources — is completely different in character from that which is created by labor. To fail to recognize that difference lies at the bottom of our inequality problem. Explore the ideas of Henry George. Between 1885 and 1900 or so, everyone knew the name and many well understood his ideas. You might start with “Social Problems” or the more analytical “Progress and Poverty,” or his speeches, “The Crime of Poverty,” “Thou Shalt Not Steal,” among others, online at http://www.wealthandwant.com. See also http://lvtfan.typepad.com. Bob Schiller knows some of the ways people grow wealthy in their sleep, without lifting a finger. He knows aboutboom-bust cycles, and the economic agony they cause to ordinary human beings in our society. He chronicles, he measures, he profits from the selling of those measurements. Perhaps he has played the game Monopoly, and maybe he knows that it was not created in the 1930s, but has its roots in The Landlord’s Game, created by late 1902, to teach the ideas of Henry George, who, it is likely, was at least mentioned in his Eco 101 textbooks, though perhaps glossed over by a busy and unaware instructor. Milton Friedman, another economic eminence, maintained that land value tax was the “least bad” tax, but never lifted his voice to promote it further than that acknowledgment (in 1968 and 2006 and perhaps in between). He likely had other kinds of interests top of mind. Let’s not just “mitigate the worst effects.” Let’s acquaint ourselves with the structures that create those worst effects, and destroy them! Go to the root! Be radical! Eradicate those structures! Dare Professor Schiller strike at the root? Dare he point to the root? Has he sought the root? Or is he content with hacking — nibbling — at branches, which doesn’t help the victims a tenth as much as striking at the root? Ironically, Professor Schiller is the “Sterling Professor of Economics” at Yale. That seat was endowed by Jack Sterling (1844-1915), co-founder of the law firm Shearman & Sterling with Thomas G. Shearman (1834-1900)*, upon his death in 1918. Shearman knew where the root was, and devoted himself to seeking its eradication. (Explore the NYT archives for references.) It is ironic that nearly 100 years later, the occupant of that seat (and many other things at Yale) is content with nibbling. But maybe it isn’t surprising. Lots of alumni would not be happy to have those roots identified, and even a tenured professor could be uncomfortable being the one to call attention. They might be the ones who endow the next set of professorships, from the gains they’ve made based on the unjust and unwise structures their respected — and aspiring — professors have failed to publicly question. Let’s not “insure against inequality.” (Who gets to collect that insurance, and how does it compare to theirlosses?) Let’s find ways to create a level playing field on which all can prosper. Sustainable and just to all. FREE TRADE AGREEMENTS – WHY? Who would fall for a brazen scheme that strengthens protection under the guise of free trade? Maybe it’s worth looking at the supposed free trade deal we signed with America a decade ago, writes Ian Verrender. No-one has ever really nailed down the author. Some reckon it was Albert Einstein. Others say it was Benjamin Franklin. 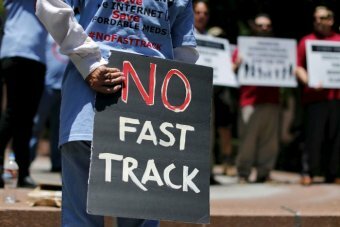 Regardless of who exactly owns the copyright to that little pearl of wisdom, it’s a sentiment with a particular resonance as Australia once again lines up to sign yet another free trade agreement with America: this time the wistfully named Trans Pacific Partnership. As any first year student of economics can attest, there is absolutely nothing wrong with free trade. In fact, it is the holy grail, the fundamental principle that underpins much of modern economic thinking. The problem is free trade agreements. In most cases, they have very little to do with trade at all, and in almost all cases, nothing at all to do with free trade. For the most part, they are political documents. They offer politicians a stage, a platform upon which to demonstrate that they are “getting on with the job”; they keep bureaucrats busy; and they offer everyone involved the opportunity to speak in acronyms. When it comes to economic benefits, however, they can be downright harmful. And just like the Australia US Free Trade Agreement (AUSFTA to the cognoscenti) signed a little over a decade ago, the Trans Pacific Partnership has the potential to seriously compromise Australian sovereignty while delivering almost nothing in economic terms. Trade Minister Andrew Robb recoils at the suggestion. A few months back, when fears over the TPP and the incredible secrecy behind it all began to grow louder, he thundered that it was all a “scare campaign” and promised that he would not sign anything that damaged Australia’s health system. “Why would I? Why would I go and tear up the system?” he asked. Why indeed? Back in 2004, then health minister Tony Abbott made a similar promise as Australian trade negotiators were on the cusp of signing that historic free trade deal with America. It was a trade deal that fundamentally altered Australia’s Pharmaceutical Benefits Scheme, limited the Commonwealth’s power to price medicines cheaply, and contributed to the soaring costs of our health system. More on that later. Those whipping up the “scare campaign” against the TPP were delivered a beautifully timed snippet of academic firepower last week in the form of an annual trade and assistance review from the Productivity Commission. Bureaucrats don’t usually take to criticising government achievements, but commission chairman Peter Harris wasn’t mincing words as he took a microscope to the furious round of recent signings. Preferential trade deals, according to the report, add to the cost and complexity of international trade. This wasn’t a new message. In 2010, the Commission penned a wide-ranging report into our bilateral and regional trade deals that should have been compulsory reading for our politicians. Sadly, it seems, they took no notice. The best way a nation can benefit from free trade is to dismantle its own trade barriers, the report concluded. Australia has already done just that. Just to rub a little salt into the wounds, the report noted that “it appears that businesses generally have made limited use of the opportunities available from Australia’s existing BRTAs”. The reason is that they are complex legal documents. A trade deal with one country bears no resemblance to one negotiated with another country. They become an exercise in dreaded “red tape” that tend to limit rather than foster trade. It’s not just academics and bureaucrats pooh-poohing the grand achievements of our pollies. A survey conducted by the Australian Chamber of Commerce and Industry, while supporting trade agreements, found that accessing the benefits was a “hit and miss” exercise. In another damning report last year, the business lobby group said most agreements were so poorly drafted and so complex that they were next to useless in a commercial sense. Specifically, it wants copyright laws and patents tightened and extended. These are agreements that offer protection to corporations and investors, usually justified on the grounds that innovation requires a reward. The problem is, protection is the antithesis of free trade. Only a slippery politician could come with a strategy of strengthening protection under the auspices of a free trade deal. Who would fall for a brazen scheme like that? Er, maybe it’s worth a look at the supposed free trade deal we signed with America a decade ago. For a good explanation of the debacle visited upon Australia by our ineptitude during those negotiations,it is worth reading Australian National University’s Thomas Faunce’s excellent piece in The Conversation. Since 1940, when the Pharmaceutical Benefits Scheme was formed by a referendum, the Federal Government had used a method known as “reference pricing” to screw down the cost of medicines, to the benefit of ordinary Australians. But the trade deal of a decade ago outlawed that practice. Either we didn’t see it, or didn’t understand it. It seems our politicians and negotiators appeared only to discover the full effect of what they signed after the document had been ratified. From 2007 on, the PBS was divided into two separate formularies, which significantly raised the cost of medicines in Australia. It was a clarion call for a round of future austerity. There was no mention of the AUSFTA debacle, a pact that cemented the power of big pharmaceutical companies and dealt a fatal blow to the hopes of some American politicians who wanted to emulate Australia’s Pharmaceutical Benefits System. Having won in Australia, America then used the same tactic in its negotiations with South Korea. In the past week, President Barack Obama has managed to rescue what just weeks ago appeared to be a doomed trade proposal. He’s been given fast track approval to proceed with the deal. Given our acquiescence on all things American and the propensity of our politicians to grandstand at any opportunity, expect this one to go through pronto. Hopefully, it doesn’t give Einstein’s estate – or Franklin’s, for that matter – ammunition to sue me for copyright breaches. That’d be insane. Asylum seekers in NSW will be eligible for the most generous travel concessions in the country, after Premier Mike Baird said the state had a responsibility to help those who had nowhere else to turn. Asylum seekers who meet certain criteria will, from next year, be eligible for travel at $2.50 a day – the same travel concession available to those on the Gold Pension Concession Card. 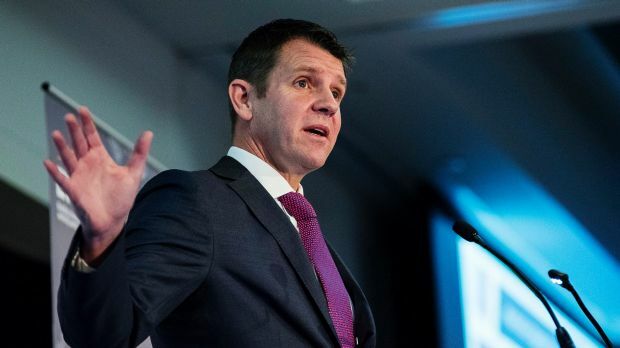 “NSW is Australia’s economic powerhouse, but there is little point in having a strong economy unless we use this strength to help the vulnerable among us,” Mr Baird said in a statement. 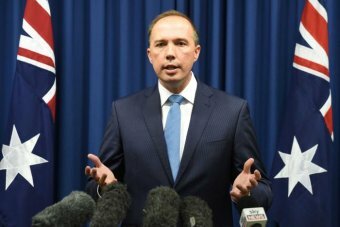 “NSW has shown we are prepared to help asylum seekers in our community and we want to do even more,” he said. Premier Baird’s stance marks a clear contrast with the federal government’s treatment of, and rhetoric towards, asylum seekers. The Premier, whose politician father Bruce resisted the Howard government’s policy toward asylum seekers, has already said Prime Minister Tony Abbott should do more to help the vulnerable. Under the policy announced on Friday, applicants for concession travel must either be holding a bridging visa or applying for one, they must be over 17 years of age and receiving aid from a designated agency. Transport Minister Andrew Constance said: “We are providing these travel discounts to asylum seekers to help them participate more fully in our society and access a range of social and community services. The Schiller Institute gives some interesting data about the letters’ history. The Philosophical Letters were published by Schiller in the March 1786 edition of Thalia, Schiller’s journal of poetry and philosophical writings. The idea for the letters arose earlier, during Schiller’s academic years. The poem Friendship,which is quoted in part in the letters, originally appeared in an anthology of his poems in the year 1782 and was referred to as coming from the letters of Julius to Raphael, a yet unpublished fictional work. Although the letters are represented as a fiction, the Theosophy of Julius, which is the centerpiece of the correspondence, clearly reflects the philosophical outlook of the young Schiller. The role of Raphael was assumed by Schiller’s friend Christian Gottfried Körner. The beginning of the first letter from Raphael was apparently written by Körner, and the second letter from Raphael, which is the concluding letter of the correspondence, was definitely written by Körner and not Schiller. I copied the following from http://www.gutenberg.net. The reason passes, like the heart, through certain epochs and transitions, but its development is not so often portrayed. Men seem to have been satisfied with unfolding the passions in their extremes, their aberration, and their results, without considering how closely they are bound up with the intellectual constitution of the individual. Degeneracy in morals roots in a one-sided and wavering philosophy, doubly dangerous, because it blinds the beclouded intellect with an appearance of correctness, truth, and conviction, which places it less under the restraining influence of man’s instinctive moral sense. On the other hand, an enlightened understanding ennobles the feelings,—the heart must be formed by the head. The present age has witnessed an extraordinary increase of a thinking public, by the facilities afforded to the diffusion of reading; the former happy resignation to ignorance begins to make way for a state of half-enlightenment, and few persons are willing to remain in the condition in which their birth has placed then. Under these circumstances it may not be unprofitable to call attention to certain periods of the awakening and progress of the reason, to place in their proper light certain truths and errors, closely connected with morals, and calculated to be a source of happiness or misery, and, at all events, to point out the hidden shoals on which the reason of man has so often suffered shipwreck. Rarely do we arrive at the summit of truth without running into extremes; we have frequently to exhaust the part of error, and even of folly, before we work our way up to the noble goal of tranquil wisdom. Some friends, inspired by an equal love of truth and moral beauty, who have arrived at the same conviction by different roads, and who view with serener eye the ground over which they have travelled, have thought that it might be profitable to present a few of these resolutions and epochs of thought. They propose to represent these and certain excesses of the inquiring reason in the form of two young men, of unequal character, engaged in epistolary correspondence. The following letters are the beginning of this essay. The opinions that are offered in these letters can only be true and false relatively, and in the form in which the world is mirrored in the soul of the correspondent, and of him only. But the course of the correspondence will show that the one-sided, often exaggerated and contradictory opinions at length issue in a general, purified, and well-established truth. Scepticism and free-thinking are the feverish paroxysms of the human mind, and must needs at length confirm the health of well-organized souls by the unnatural convulsion which they occasion. In proportion to the dazzling and seducing nature of error will be the greatness of the triumphs of truth: the demand for conviction and firm belief will be strong and pressing in proportion to the torment occasioned by the pangs of doubt. But doubt was necessary to elicit these errors; the knowledge of the disease had to precede its cure. Truth suffers no loss if a vehement youth fails in finding it, in the same way that virtue and religion suffer no detriment if a criminal denies them. It was necessary to offer these prefatory remarks to throw a proper light on the point of view from which the following correspondence has to be read and judged. Love does not exist between monotonous souls, giving out the same tone; it is found between harmonious souls. With pleasure I find again my feelings in the mirror of yours, but with more ardent longing I devour the higher emotions that are wanting in me. Friendship and love are led by one common rule. The gentle Desdemona loves Othello for the dangers through which he has passed; the manly Othello loves her for the tears that she shed hearing of his troubles. When I hate, I take something from myself; when I love, I become richer by what I love. To pardon is to recover a property that has been lost. Misanthropy is a protracted suicide: egotism is the supremest poverty of a created being. This week in politics and media was a wreck: beginning with Zaky Mallah and the troll casting on Q&A, to the inflated hypocrisy of the tabloid response and the blustering outrage of government, writes Jonathan Green. a situation that has been comprehensively mismanaged, characterised by a string of blunders and miscalculations. … or any given week in the Australian media and politics. Actually not just any week, this week: this rolling, muddy scuffle of buffoonery, self-interest, score settling and fear. Yes the whole Zaky Mallah farrago, from thoughtless Q&A troll casting, to the grotesquely inflated hypocrisy of the tabloid response and the censorious, red-cheeked, blustering outrage of government. A week that has shown the media class at its worst: reactive and self-absorbed, simultaneously inconsequential and self-important. Or worse: driven by petty vindictiveness over public interest. The public interest here is simple: freedom of speech, pluralism. And maybe Q&A has done some harm to that cause through accident, overconfidence and misadventure, but the thrust of its endeavour was right. Here is a young man, once radicalised, now reformed, whose central message is disdain for the “wankers” of Islamic State. That’s a voice that has a place in our conversation about the promotion of terror, but not if politics has anything to do with it. I think many, many millions of Australians would feel betrayed by our national broadcaster right now, and I think that the ABC does have to have a long, hard look at itself, and to answer a question which I have posed before: whose side are you on? Betrayed by an admission of complexity? Betrayed by an attempt to consider the full range of the conversation? This is the sort of freedom that surely our war should defend. To call it a betrayal is to protest too much, is to reveal the thinness of the politically self-serving construct of “us” against some nameless but omnipresent “them”, a construct remote from reality, but one that the ABC is seemingly bound to defend. Us and them meant something rather different by the time the tabloids got their hands on the story, and here it became just another shot in a vicious culture war, a culture war with the added edge of deep commercial self-interest and simple spite. It takes a special kind of dulled self-awareness to produce front page images of Mallah in every major capital outside Perth and then complain, with heated outrage, of how the ABC had given this demon “publicity”. Never mind equating the entire staff of the public broadcaster with IS, that’s just offensive hyperbolic groupthink; the hypocrisy is the real killer. And as good a demonstration as you might hope for of how profoundly self-regarding and fundamentally broken mass media is in this country: that one corporation’s sense of indignation and outrage can somehow become a strangely confected, stable-wide news event. It’s too easy to imagine that the real intent of Wednesday’s ubiquitous News Corp covers was to do harm to a public broadcaster whose presence in the Australian media is the last remaining coherent check on the ubiquity of its readily manipulated media message. This is a lesson in how media can operate: not reflecting with an objective sense of significance and priority on the events of the world it claims to report with fairness and good faith, but here, as so often, devoting every resource to a vendetta. Here was our moment: politics trading on fear and hoping for little short of acquiescent propaganda from media, media responding with an unseemly readiness to betray its public’s reasonable interest in the simple truth. And after all of that the thing that should have kept Mallah off the TV were not his views on terror, or jihad, or his loathing of Islamic State. 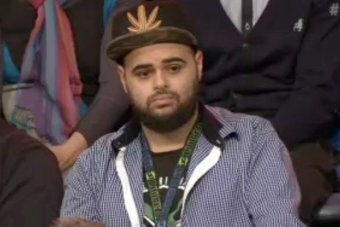 Mallah should have been a no-go zone after he tweeted threats of sexual violence against columnistsMiranda Devine and Rita Panahi a few months past, threats repeated with idiotic zeal after this fuss blew up, threats that should have been known to the producers who scheduled a question from him to add ginger to Monday’s program. It’s all of a piece in this muddle of media and politics, that violence against women plays second fiddle in this saga to Mallah’s alleged, and for the most part imagined, links to terror. Yet in pursuit of one we are prepared to surrender liberties, democratic process and perhaps even chip away at the rule of law. Never mind the dedication of billions to schemes only likely to inflame the very radicals they seek to imprison, banish or deter. And for the other? The real killer, the true source of so much domestic terror? The usual political routine of penny-pinching, platitudes and lip service. Put it all together and you might just give way to despair. Jonathan Green is presenter of RN Sunday Extra. He has recently been appointed editor of the literary journal Meanjin. This will be his last regular column for The Drum. Allegiance will soon be a necessary condition of citizenship, under a new law designed by the Government to get around the constitutional problem that it can’t declare someone guilty of a crime, writes Michael Bradley. This one is the kicker. I’m about 60 per cent convinced it’s constitutionally invalid, but assume it stands up. It’s been designed to avoid the constitutional problem that the Government can’t declare you guilty of a crime. Instead, it says that, if a dual citizen or a foreign national “acts inconsistently with their allegiance to Australia” by engaging in certain conduct, they will renounce their Australian citizenship. So, it’s like saying “I’m not Australian anymore”, except by actions instead of words. Funny, I didn’t know that allegiance was a necessary condition of citizenship. Nobody’s ever asked me to declare it. The list of conduct is very long: engaging in terrorist acts, financing terrorism, recruiting or training for a terrorist organisation, blowing things up overseas, and those “hostile activities” in foreign countries again. These are borrowed over from the Criminal Code, the critical distinction being that you don’t have to have been convicted, or even accused, of committing an actual offence. You renounce your citizenship by doing the act, whatever it is, as soon as you do it. It’s automatic and self-inflicted. So you’re no longer a citizen, according to the Act. Who will know? Obviously, it has no practical consequence until somebody notices and acts on it. That means the Government saying “hey, we’ve noticed you’re not a citizen anymore, so we’re deporting you”. What the bill says is that, when the Immigration Minister notices that you’ve renounced your citizenship by your actions, he has to give written notice of it to whoever he thinks he should. Presumably his own department, so it can track you down and kick you out of Australia or refuse you re-entry. And there’s the problem. How does the Minister notice that you’ve renounced your citizenship? By noticing that you’ve done a particular thing. To illustrate by random example: say ASIO tells the Minister that you’ve been doing some public fundraising for a charity based in Syria. ASIO thinks the charity is a front for IS, and it thinks you’ve been reckless as to whether the funds will end up in terrorist hands. That’s the definition of financing terrorism in the Criminal Code, and if ASIO is right then you have renounced your citizenship. The Minister says “thanks ASIO”, and deports you. To do that, he has to accept that the factual allegations are correct. You have no right to be heard before he does so. You can take your case to the courts where you’ll have the onus of proving that you honestly thought the Syrian charity was legitimate, which might not be of all that much comfort if you’re already on a plane to Damascus. I’m not very comfortable with that. Michael Bradley’s firm Marque Lawyers is presently advising Amnesty International Australia on the legal validity and effect of the bill referred to in this article.